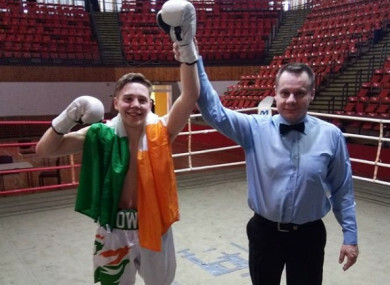 Coachford College student James Power is now 4-0 with four KOs after a last-minute flight to Hungary. James Power, still just 17, celebrates his fourth career win. JAMES POWER, IRELAND’S youngest professional boxer at the age of 17, picked up a fourth consecutive stoppage victory in the punch-for-pay ranks with a second-round TKO over a local opponent in Hungary on Saturday. Power, a Leaving Cert student at Coachford College in his native Cork, flew over on extremely short notice after a week of school, making weight upon his arrival on Friday night and taking to the ring the following morning. In what was scheduled to be a six-rounder, the lightweight prospect needed less than two. He halted his foe with a crippling left hook to the body, improving his record to 4-0(4KOs) in the process. Power remains too young to obtain a fighter’s licence from the Boxing Union of Ireland, but will become eligible to receive one and fight on home soil when he turns 18 next month. Thus far, he has fought twice in Tijuana, Mexico and twice in Hungary in a bid to gain experience before knuckling down as a full-time professional after the Leaving Cert in June. “Luckily, we had just enough notice to book flights to Hungary,” Power told The42. “Well, my mother did — as usual, she did it all for me! “I had no other plans for this weekend, so why not? Power is expected to make his Irish debut in the autumn, and says he’s “buzzing” in anticipation for a home bout. Fighting on the same bill, Dublin prospect Robbie Burke moved to 2-0 as a professional, also picking up a second-round stoppage against a local journeyman. Email “Ireland's youngest professional boxer, 17, stops fourth consecutive opponent”. Feedback on “Ireland's youngest professional boxer, 17, stops fourth consecutive opponent”.